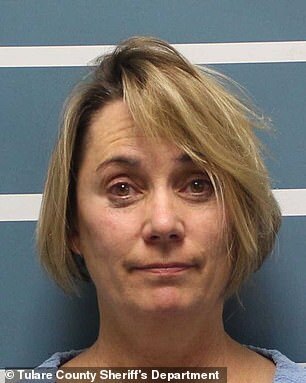 A high school teacher has been arrested after forcibly cutting a student's hair in class while belting out The Star Spangled Banner. 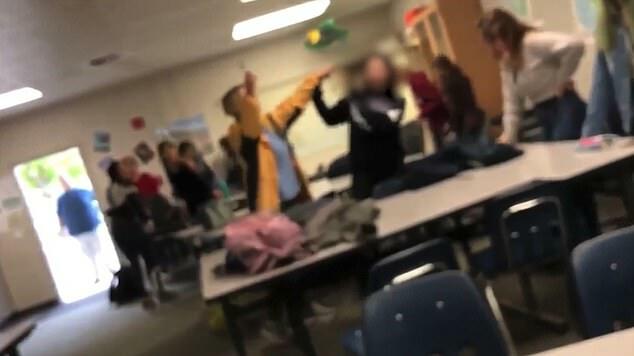 Videos posted on social media showed Margaret Gieszinger cutting off chunks of a student's hair at University Preparatory High School in Visalia, California. College of the Sequoias police responded to the classroom after a receiving a report of child endangerment involving a teacher and a 'pair of scissors', police chief Kevin Mizner told the Visalia Times-Delta. Gieszinger, 52, of Exeter, was later arrested on suspicion of corporal injury to a child with her bail set at $100,000. 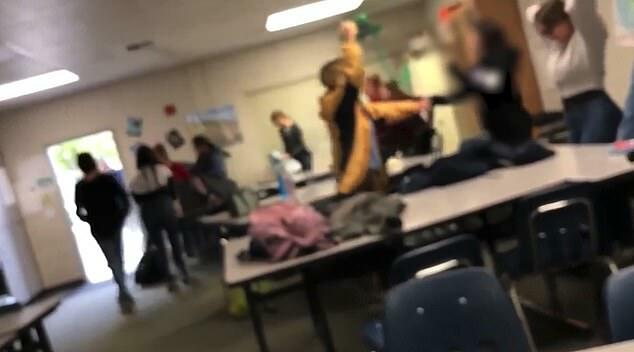 It came after videos posted online showed science teacher Gieszinger chasing students in the classroom while singing the national anthem. 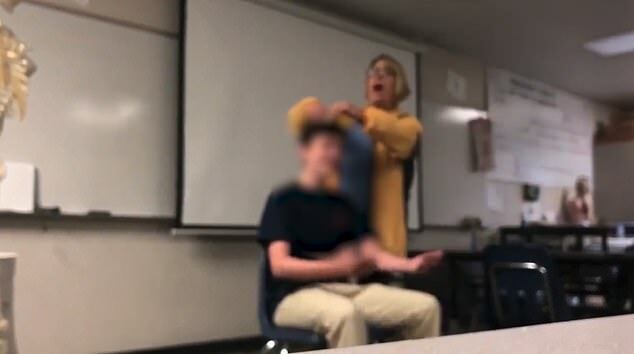 In one clip, a male student is seen sitting in a chair at the front of the classroom as Gieszinger cuts off bits of his hair. She is also seen approaching a female student and appearing to grab a chunk of hair to cut. Other students in the class scream and run out of the room as Gieszinger continues singing the national anthem, according to the Times-Delta. He incident occurred during Gieszinger's first period chemistry class, KFSN-TV reports. Students said the teacher had come into the classroom with a pair of scissors and informed them that it was hair cut day. 'We think she's going to try to be funny and be like, 'Oh, did you really think I was going to cut his hair?' one student told KFSN. The student, who asked not to be named, said he ran to the school's main office to get help. 'I hope I never have to see her at the school again, because I know for a fact I can never see her as a respectable authority figure in my life,' he added. The student also said that Gieszinger had a similar 'freak out' earlier in the week when she discovered a test was missing. The Commission of Teacher Credentialing confirmed Gieszinger's credential was suspended in 2007 and 2016, the Times-Delta reported. Each suspension lasted 14 days, but it's unclear why her credentials were suspended on those occasions.